We traveled through Sao Paulo on our way from Quito to Kenya. 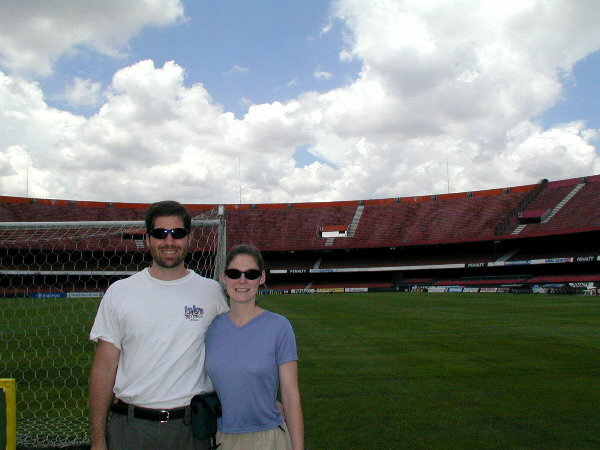 We only spent about 30 hours in Sao Paulo but we did do some touring, took some pictures, and have a couple interesting stories/points, so it is web page worthy. We stayed in an awesome 5 star hotel with one of the most comfortable beds ever, and 6 movie channels! Our friend Brian in Atlanta had suggested we stay at the Renaissance Hotel for some high class treatment. 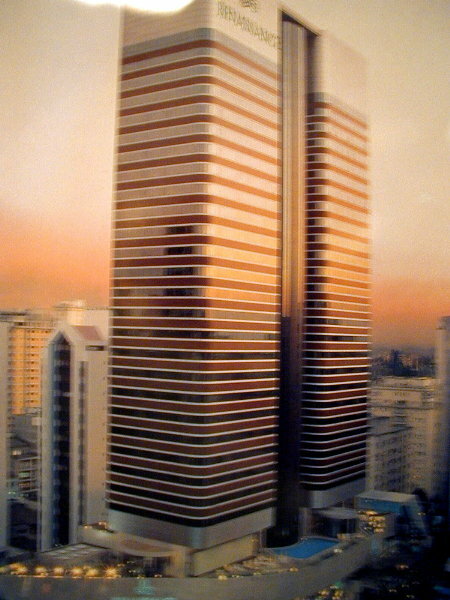 It is in the Jardins section, which has been described as the 'Buckhead' section of Sao Paulo. We walked to dinner that night around the corner to Margarita Pizza, a popular pizza place. It was a very clean and neighborhood-like area -- Kristen thought it looked like some of the neighborhoods in New York. We had heard that during rush hour it can take 3 hours to get from one side of the city to the other. 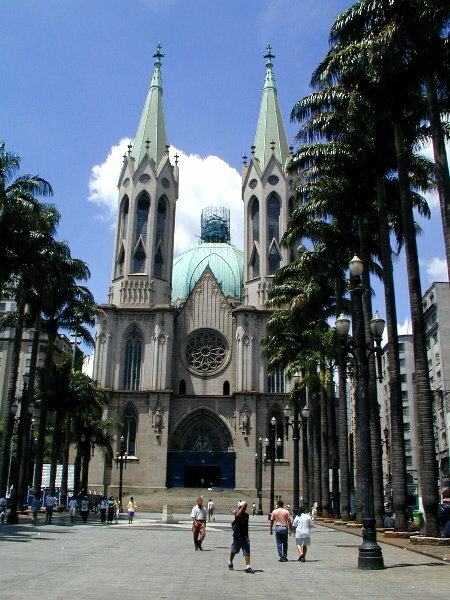 Fortunately, this weekend was the 400+ anniversary of Sao Paulo, so most people had gone out of the city on vacation. Traffic was not bad at all. We asked the hotel concierge to set up a short tour of the city. 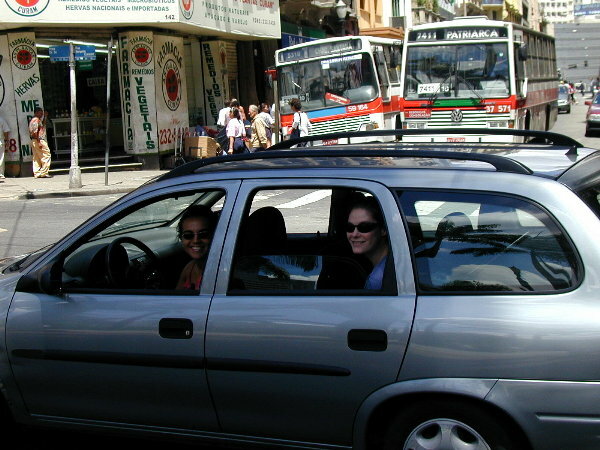 They hooked us up with Katya, a native, who drove us around many diverse parts of the city. The 5 star Renaissance Hotel in the Jardins area of Sao Paulo -- great digs for one night in town. 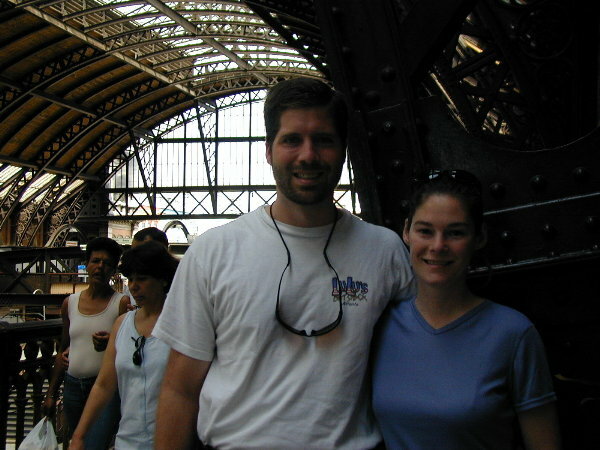 Just after this picture in the old train station, the security guard came up and told us it is illegal to take pictures in the train station! Our guide said 'ok' in Portuguese and we left. 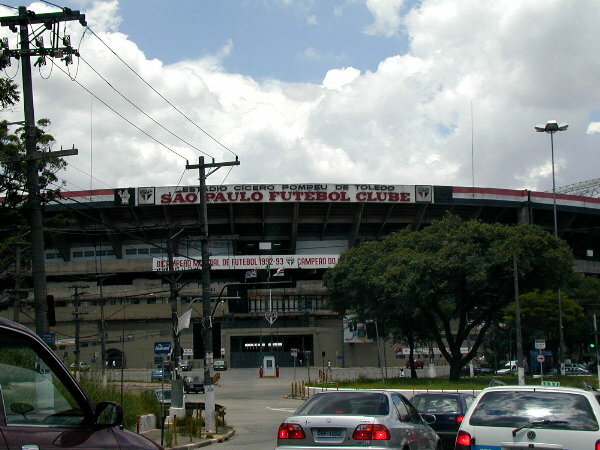 The famous futbol (soccer) stadium where Madonna, the Three Tenors and other musical groups have played.. They let us onto the field so we had to take a picture!. One of the nice restaurants in Sao Paulo used to be a coffee farm. 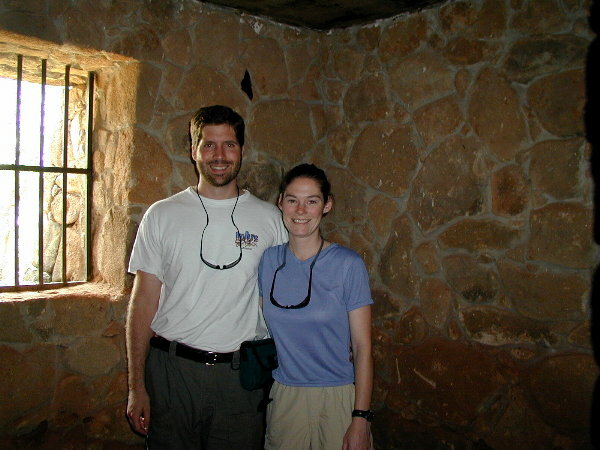 We are standing in the slave quarters of the main building. More specifically, we are standing in the room that the slaves went to make more slaves . 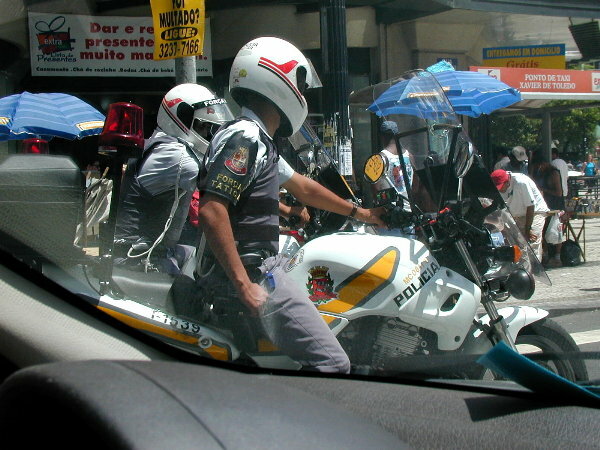 Check out the equipment of the Sao Paulo motorcycle police. ...and Kristen safe in the car watching Dan take the picture of the Cathedral!. From the first day in Quito Dan had been having a hard time getting a full breath, and on the Andes Trek he paid dearly for not being able to breathe well. But we assumed those cases were because of the high altitude, so we waited until Sao Paulo to do anything about it. Sao Paulo is around 750 feet elevation, so when Dan still not could not take a full breath well, we figured we needed to do something about it before Kilimanjaro altitudes. We had signed up with IAMAT so we decided to use it. We called the local number for the IAMAT doctor and he answered the phone right away. When he noticed I was speaking in English he changed to perfect English, and told me to come in whenever we could get there and he would fit me in. We hired a hotel car and they took us across town to his office -- it was a completely unmarked house in the middle of what looked like a regular neighborhood. The barred gate was locked, and the receptionist had to unlock it to let us in. Once inside it looked like any doctor's office/waiting room. Dr. Konrad came out and welcomed us into his office and talked with us for a while. He had lived in Sao Paulo for 44 years but studied in the US and speaks 4 languages fluently. He checked me out and determined that although I had lots of phlegm in my lungs I had no other serious symptoms. He said that it was probably my body's reaction to the pollution in Quito and Sao Paulo and then the altitude brought out the worst of the symptoms -- inability to fully inflate the lungs. He prescribed a standard expectorant, talked to us some more, then let us go. We paid the standard $55 IAMAT fee and were on our way. Unfortunately, the expectorant had little to no impact and the breathing remained an issue (see Worst Medical Crisis). We had bought our own tickets from Quito-Sao Paulo, since no One World airline covered that leg. There are no direct flights and we had options of flying through Columbia, Panama, or Lima, Peru. We chose Lima because it was the most direct route. We flew Servensa airline to Lima. We were the only people in business class (no first class) -- and no flight attendant spoke English. When we got into Lima, the airport looked very old and had lots of cargo planes all over. When we got off the bus to the terminal, Kristen fortunately heard a guy say something about Sao Paulo/Rio. He spoke no English, but we saw that he had a list of names, including ours, on a piece of paper. He said to follow him. He walked us right around customs (no one seemed to notice), made us get our bags (even though we thought they were checked all the way through to Sao Paulo), then leave them at the conveyor belt (unattended) and then he took our passports, tickets, immunization cards, dropped us at the VIP lounge and somehow communicated that he was going to his office. We felt completely naked! The VIP wench asked for our passports or tickets to authorize us to be in the lounge, and we had difficulty explaining to her that we had none of that, and that some guy had them (she spoke no English). Finally we gave her our boarding passes for the previous flight, and she seemed pacified. We sweat it out in the lounge, hoping the guy with our life documents was legitimate. About 20 minutes before the flight took off, the guy came in with our baggage claim tickets, our boarding passes, our passports stamped, and everything we needed to get on our way. Fortunately, this was a legitimate, though pretty sketchy process. +55 11 5687 4918 Very nice IMAT doctor. +55 11 3069-2233 Outstanding 5 star hotel.